The kind of people who are able to buy property anywhere in the world, like George Clooney for example, choose to buy property in Laglio. Driving along Lake Como after leaving Cernobbio you pass the wonderful 19th Century villas of both Moltrasio and then Laglio. Both towns are beautiful with traditional cobbled stone centres, lovely churches, welcoming cafes and exceptional views. The best places to stay in Laglio are those with the best views of the lake. The 11th Century Romanesque Chiesa di Sant’Agata with its amazing frescoes is definitely a must see. If you fancy going to try and spot George Clooney reclining beside the lake, head down to his beautiful Villa Oleandra that was once owned by the Heinz family. The lake is obviously a big reason that people come to visit Laglio, it's pretty hard to miss to be honest. As well as hotels, our Gurus have also included a couple of converted villas in their list of the best places to stay in Laglio. Relais Regina Teodolinda has gardens which spread right down to the water’s edge. There are just six suites which have a relaxed, almost rustic charm with all the modern conveniences of course. Views are wonderful - of course! 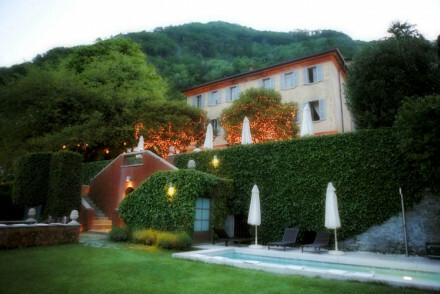 Relais Villa Vittoria is a wonderfully romantic hotel, also right on the edge of the lake. As well as beautiful views, this hotel has 11 sumptuous rooms, an excellent restaurant and peaceful terraces overlooking the lake. Perfect for honeymooners. The best aiport for getting to Laglio is Milan (25 miles). The best time to visit Laglio is from June to September, when the temperature sits comfortably in the twenties. Still not sure which is the best place to stay in Laglio for you? Browse through our list of all the best places to stay in Laglio.